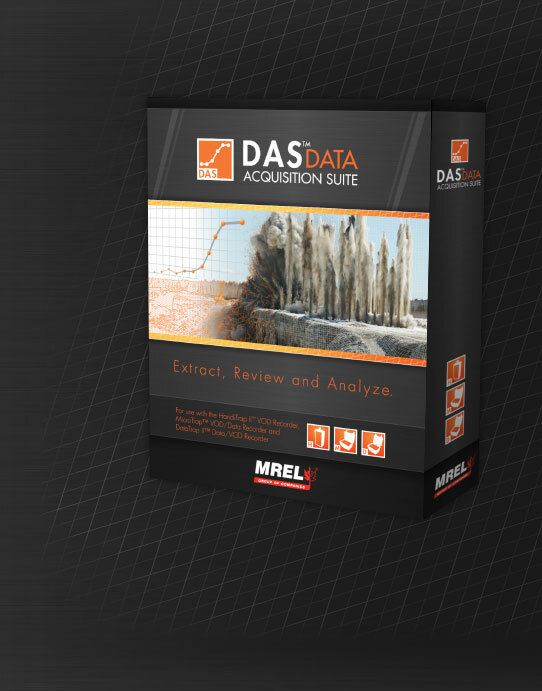 MREL offers an optional software upgrade path to the Advanced Edition of DAS™ Data Acquisition Suite for those Customers desiring additional software tools including data filtering, noise removal and data smoothing filters. DAS™ Data Acquisition Suite runs under Windows® 32-bit and 64-bit operating systems and allows Customers to program their MREL recorders, download recorded data, display graphs of the data, analyze the graphs, annotate the graphs, and filter the data on the graphs quickly and easily in an iterative and intuitive manner. Graphical results can be easily copied and pasted into other Windows programs for inclusion in presentations and reports. DAS™ Data Acquisition Suite is the software foundation upon which additional advanced software tools will be developed and made available to registered Customers. 1: Open Data Files: Open your data files. 2: Hardware: Choose, setup or download tests from your MREL recorder. 3: Analyze: Review and analyze your data. 4: Treeview File Structure: Review multiple files, associated channels and data. 5: Graph Area: Main graph review area. 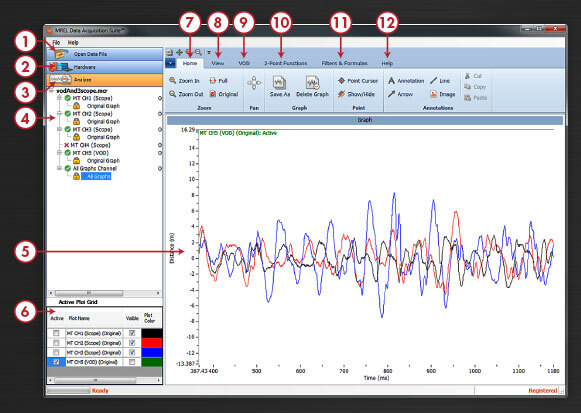 6: Active Plots: Activate a plot for various operations and control the visibility of plots. 7: Home: Zoom, Pan, Graph, point cursor and add annotations. 8: View: Graph axes, edit graph styles and show/hide elements. 9: VOD: Calculate VOD, Choose the method of calculation and review the data. 10: 2-Point Functions: Calculate ΔX and ΔY. Apply Y Offset. 11: Filters and Formulas: Open, review and manage filters (Only available in the Advanced Edition of the software). Apply formula. 12: Help: Display built-in Help, contact Support, register and upgrade your software. Get Updates. Includes all the features and capabilities of the Standard Edition with additional data filtering, noise removal, and smoothing filters not available in the Standard Edition.